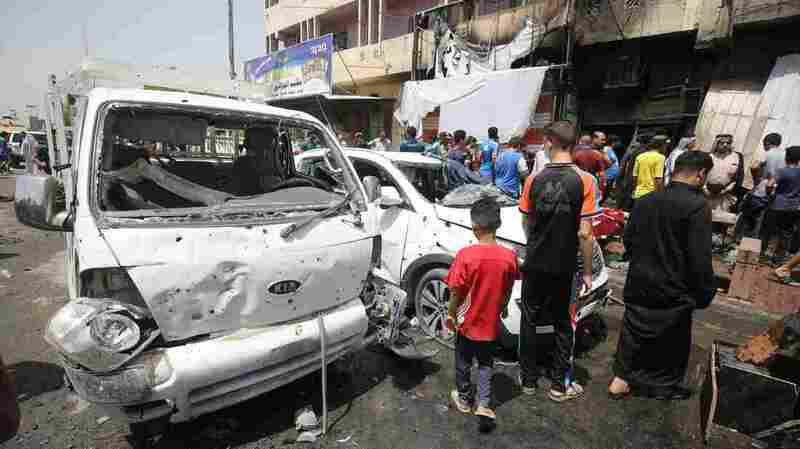 Suicide Bombings In Baghdad Kill More Than 85 People : The Two-Way The Islamic State has claimed that it carried out three attacks in different parts of the Iraqi capital. Two of the bombings targeted checkpoints, while another hit a crowded outdoor market. Iraqis look at the damage following a car bomb attack in Sadr City, a Shiite area north of the capital, Baghdad, on Wednesday. Updated at 1 p.m. ET. Three suicide bombings hit Baghdad on Wednesday, killing more than 85 people. The attacks — car bombings at an outdoor market and at a police checkpoint, and a checkpoint blast set off by someone on foot — have been claimed by the Islamic State, NPR's Alison Meuse reports. In the morning's market blast alone, the death toll was at least 62, Alison says, citing Iraqi authorities. "Iraq's Interior Ministry says more than a third of the victims were women and children," she reports. "The attack comes as Iraqi forces press offensives against ISIS. According to U.S. estimates, ISIS lost 40 percent of its territory in Iraq over the past year. But it is still capable of carrying out attacks in the capital." The Associated Press says at least 85 people were wounded in the car bombing at the market. 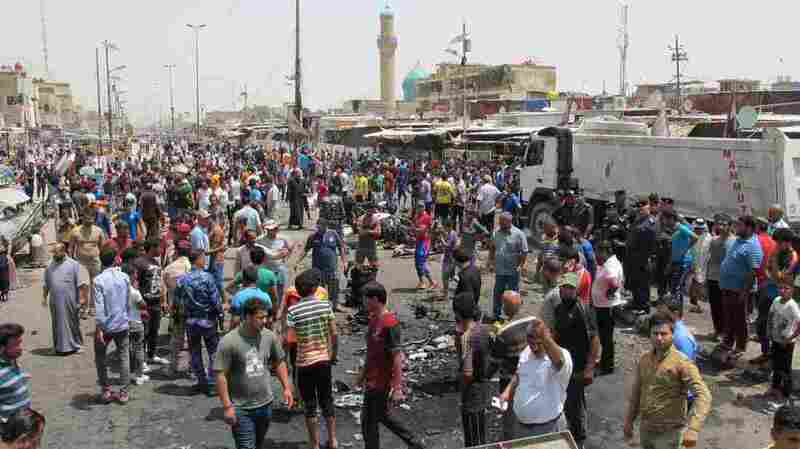 The wire service, citing two police officers, says the explosion struck "a crowded outdoor market in Baghdad's eastern district of Sadr City." Sadr City is a predominately Shiite neighborhood. The BBC's David Bamford reports it's frequently attacked by the Islamic State — a Sunni militant group. "They regard the Shia Muslims as heretics, and they're seeking to undermine the government's efforts to maintain security," he says. The market attack was the deadliest to strike Baghdad in months, The Washington Post reported. "Just moments before the second wave of bombing began, the spokesman for Iraq's prime minister struck a defiant tone on TV. He vowed terrorist attacks would not get in the way of defeating ISIS. "As he spoke, a suicide bomber was waiting at checkpoint in the Shiite district of Khadmiya. The explosion killed a number of police, but mainly bystanders. Minutes later, another car bomb exploded at a checkpoint in the west of the city."